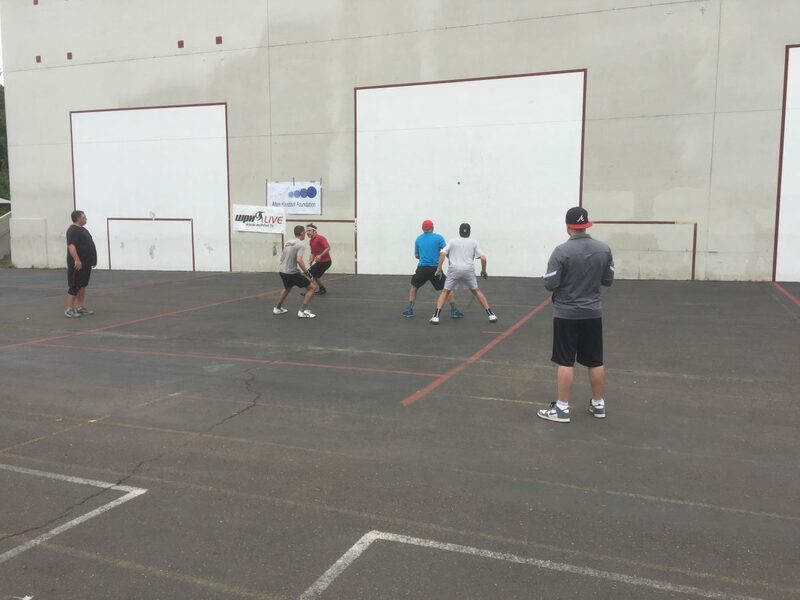 Portland, OR, WPH Press, 8/25/18- The 4th annual Portland One-Wall Big Ball Doubles tournament was held on Saturday, August 25th at Roseway Heights School in Portland, Oregon. Despite a mid-summer cool-down, cloudy morning skies, and a chance of rain, 30 players showed up to compete for the largest handball prize money purse offered in Oregon in more than two years. The $1k first place prize enticed the heavy hitters, including defending champion Bob Herrera and previous champion Andy Tucknott, as well as former WPH R48 star Aaron Garner and former Oregon State Singles champions Matt Steele and Troy Peterson. In a unique format, the 30 players were separated into an “Open” half and a “B” half, and then paired together via names drawn out of a hat so that each “Open” player is paired with a “B” player to form a 15-team bracket. Matches were set for one game to 21, except for the finals, which was best of three games, two games to 21 with an 11-point tiebreaker. The first three rounds of play saw many great match ups , including a number of matches invoking the “win by two” rule and going past 21 points and into overtime. The finals featured three former Portland One-Wall Big Ball Doubles champions, with 2016 champions Andy Tucknott and Steve Grow facing 2017 champion Bob Herrera and his partner Craig Trull. Team Herrera/Trull started hot in the first game, building a 15-3 lead and cruising to a one-game lead, 21-9. Team Tucknott/Grow fought back to even the match, winning the second game 21-10. The tiebreaker saw Herrera raise his game to another level, using a serve-and-shoot style of offense to storm to a 9-0 advantage. Tucknott and Grow worked their way back into the game, closing the gap to within three points at 6-9, but Herrera and Trull regained the serve and notched the final two points of the match to claim the title and the $1000 prize. Tucknott and Grow received $500 for second place, while Matt Steele and Dave Delaney defeated Anthony Areizaga and Efrain Palermo for the $200 consolation bracket prize. Thank you to 2016 USHA Volunteer of the Year Kimberley Duval for organizing the tournament, including providing lunch from Garlic Jim’s Famous Gourmet Pizza, and thank you to our tournament sponsors: World Players of Handball, Alten Handball Foundation, Michael Scott Stenberg Construction, and the Oregon Handball Association. To see pictures of the event and connect with the group, visit the Portland One-Wall Facebook page by clicking here.